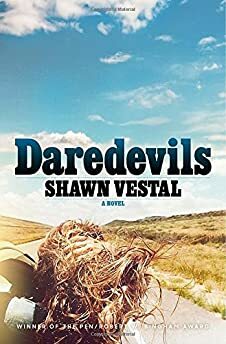 Largehearted Boy: Book Notes - Shawn Vestal "Daredevils"
Book Notes - Shawn Vestal "Daredevils"
Shawn Vestal's novel Daredevils is as vivid and heartfelt as the stories in his PEN/Robert W. Bingham Prize-winning collection Godforsaken Idaho. This is one of the year's best debuts. "The 1970s, that most unjustly derided of decades, is evoked with intimate detail in this coming-of-age story set in an American West that is expansive with possibility yet constrained in imagination. Vestal, who established a reputation for depicting this physical and psychic terrain in his short-story collection, Godforsaken Idaho (2013), intersperses these incidents with funny, persuasively rendered monologues by Evel Knievel himself, speaking throughout as the wounded, embittered, and caustically eternal voice of anyone whose yearning to defy his or her own fate is thwarted as much by his or her own hubris as by fate itself. This debut novel captures the flailings and flights of hapless dreamers with prose that throbs like the strings of an electric bass playing its sad heart out in a near-desolate landscape." In 1974 and '75 – the years in which my new novel, Daredevils, is set – pop music was entering my life with force for the first time. I was 8 and 9 years old, and I began to care about the songs that arrived unbidden through the air – the radio in the family station wagon, the radio my older sister listened to, the radio on the school bus. In the novel, my teenage characters listen to the rock music of the era: Zeppelin, KISS, Bowie. But in my own younger childhood, it was the softer, gauzier '70s music that connected – fruit from the tree of Bread. Certain songs became very important. I began to feel them. I can still hear the voice of Casey Kasem, who brought us the Billboard Top 40 each week – the most popular and important 40 songs of the week. "Keep your feet on the ground, and keep reaching for the stars." There was something urgent and important in these songs, and it was made even more so by the fact that, since I had not yet begun to buy records, I could not predict when I would next be able to hear them. I had to wait for the radio to deliver them. Many of the songs I loved back then were awful, but none of them sound awful to me, even today. Back then I was being transformed by them, a transformation that has been permanent. I have always felt, and still feel as a 50-year-old man, that pop music – whether it was the Bay City Rollers or Devo or The Clash or the Wu-Tang Clan or Sonic Youth or Vince Staples – was a crucial element of my life, and that I will always need the unexpected arrival of music that is new. Here are a few songs that were important to 8-year-old me – plus a bonus track. "The Night Chicago Died," Paper Lace – If my memory is correct, this was this song that I was caught lip-syncing in front of a mirror, with a hairbrush "microphone," by my teenage half-sister. I remember being: A) embarrassed, and B) curious whether she thought I had rock-star chops. I was feeling like I might. The tune seemed like such a rocker to me then; I remember the chia-haired band on a record cover, wearing black pin-striped suits with roses in the lapels and holding machine guns. Paper Lace was a British band, dubbed by Wikipedia "the most successful band Nottingham ever produced." Naturally, their big hit was about a fictional gun battle between gangsters – "When a man named Al Capone/Tried to make that town his own" – and cops in Chicago. "Lady," Styx – I was a weird kid. This song became the soundtrack to my crush on the superhero Mary Marvel. Mary Marvel was twin sister of Captain Marvel, and the two of them were granted superpowers by the wizard Shazam!, and I thought she was very cute, plus a superhero, so who else would I fall in love with? I was a romantic boy. I remember riding in the back of the family station, a wood-paneled Ford, hearing this song on the radio while looking at images of Mary Marvel, short skirt and cape, flying through the sky. In addition to being the background music to my ill-fated love, "Lady" was an enormous worldwide hit. If you go to the web site of former Styx lead singer Dennis DeYoung, this is the song that plays immediately, whether you like it or not. "Saturday Night," Bay City Rollers – Boy, did I love this song: the energetic spelling (S-A-T-U-R-D-A-Y Night! ), the hand-clapping, the ay-yi-yi-ing, the adorable moppet-headed Scots in the band. This song made me believe that, as I grew up, Saturday nights would be a magical time, a weekly parallel universe of girlfriends and rock and roll and preposterous tartan outfits. You can still buy insane Bay City Rollers-style clothing online. Example: The Adult Tartan Teen Sensation 70s Retro Fancy Dress Costume, available on Amazon for 33 pounds. "Kung Fu Fighting," Carl Douglas – This song made me want to do a little kung-fu fighting. More importantly, this song made me feel like I would totally be able to do a little kung-fu fighting. Sadly, I never have. "Fox on the Run," Sweet – My older sister was, in many ways, my introduction to rock music, and my guide from the worst of soft rock toward the harder stuff. I can still recall looking through her records: Bowie's Diamond Dogs, The Doobie Brothers' Toulouse Street – the one where they're naked, with strategically placed hats, inside the foldout. She had an 8-track tape of Sweet's Desolation Boulevard, and this was my favorite song. It's about groupies. Wikipedia notes that "'fox' at the time was a slang term for an attractive woman." "Only Women Bleed," Alice Cooper – What in the ever-loving hell is this song about? Surely not that. It is not, actually, a song about menstruation, but everyone I knew at the time – the intelligentsia of the elementary school – was certain that it was. Because I didn't really understand the way any of that worked then, this song was fascinating and unsettling. There were things out there in the world – many things, strange and wondrous and baffling – that were waiting for me to learn about them. "Someone Saved My Life Tonight," Elton John – This song makes a brief appearance in the novel, playing on a casino sound system. Elton John was one of my early favorites. Don't Shoot Me, I'm Only the Piano Player was the first record I bought. I liked his records as much as the songs, loved to look at the artwork on Goodbye Yellow Brick Road and Captain Fantastic and the Brown Dirt Cowboy (which had a little pooping record player on it, among other wonders in a painting of Bosch-like excess.) This song had a little jolt of naughtiness in it, which seems incredibly quaint now: the little jolt of a "damn it!" Some radio stations wouldn't play it, as a result. I thought it was daring. "Sorry for Party Rocking," LMAO – My 8-year-old son loves this song. He found it on YouTube, and then figured out how to get YouTube on our TV, and he puts it on and dances along, and pantomimes singing it. If I laugh – I mean, it is a song of surpassing ridiculousness – or if he gets any hint that I am not taking the song seriously, he gets mad at me. This song, he has made sure that I understand, is important.